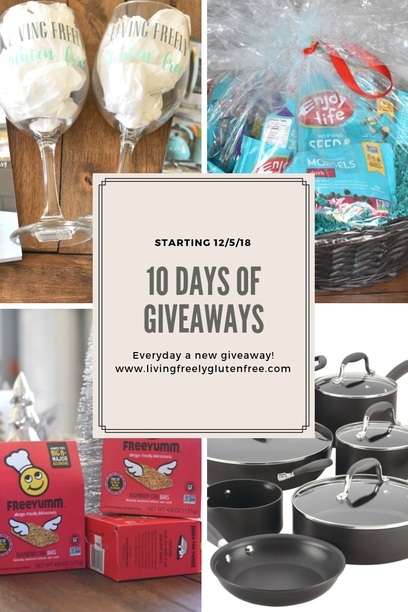 Are you ready for the 10 Days of Giveaways??!!!! Hello my Friends! 2018 has been such a blessed year for me for so many reasons. I am near my family and I can say that I am successfully running a business. The hard work and dedication has paid off, so I wanted to say thank you to all of you by running an amazing giveaway with all of my favorite things. Please always remember whatever your goals may be in life, whatever you want in life if you make strides every day towards that then you will get there! 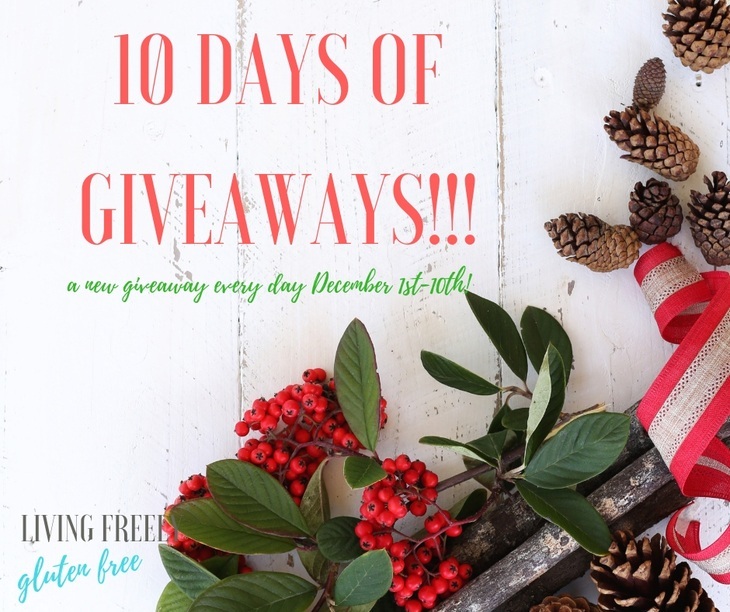 How does the 10 Days of Giveaways Work? Below you can see what the prize will be for each day. 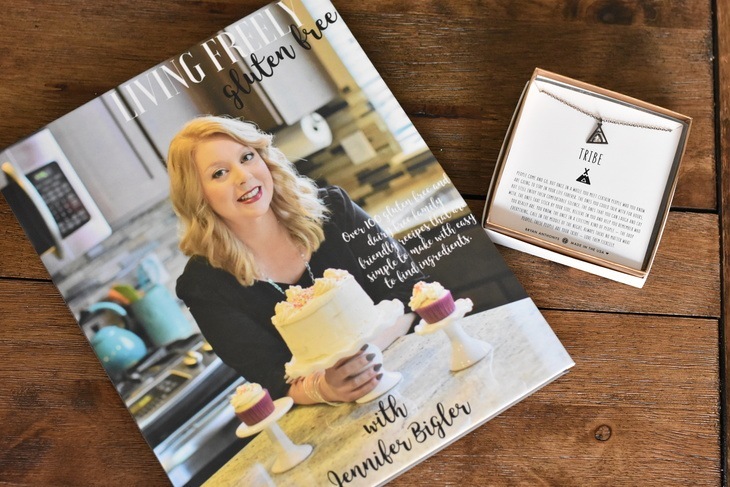 There will be a rafflecopter entry underneath the post, or a link that will take you to the blog post about the product and you will enter the giveaway there. The prizes are for U.S. Residents only. Each giveaway will last for 5 days, so make sure to keep entering to win everyday until the entry time period is over. 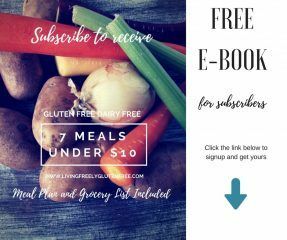 Everyday I will post a reminder on social media and the post will include a Meal Plan Program Giveaway for Facebook and Instagram. Make sure to come back every day to enter a new giveaway! Happy Holiday’s Friends!!! 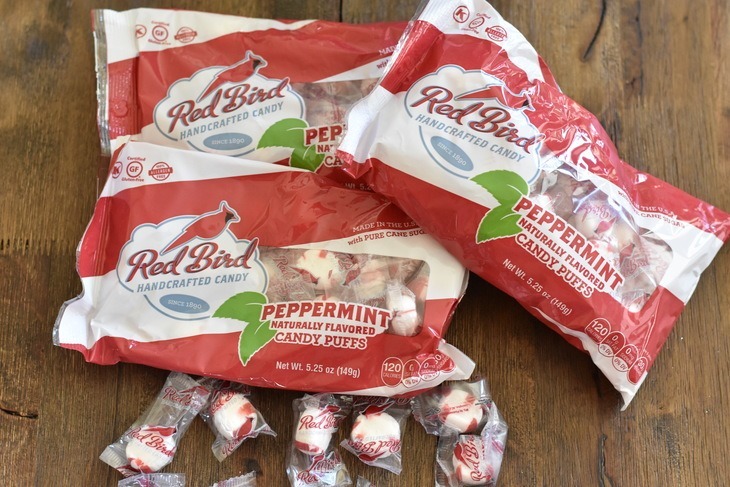 Red Bird Candy is free of gluten, dairy, corn and many other allergens. With very few ingredients these candies are my families go-to for everything, especially the peppermint candies. A delicious Double Chocolate Peppermint Christmas Cookie recipe just went it using Red Bird Candy. I love a good cocktail and so do my friends. So here is one for you and one for your bestie! Make sure to check out some of the latest cocktail recipes to fill up your glass like my Pomegranate Mimosa and Low Calorie Sparkling Cocktail. I have been taking CBD on and off since May. In the past month I have made the conscious decision that I need to take CBD everyday because it makes me less anxious, more focused, and I sleep better. Plus CBD is the company I turn to for my daily CBD intake. Head HERE to get this amazing recipe. You can also enter the contest in the blog post. With multiple allergies Enjoy Life is our safe brand. We turn to them because they offer a little bit of everything that we can enjoy. Look at this amazing prize pack!! There’s tons of goodies in there. 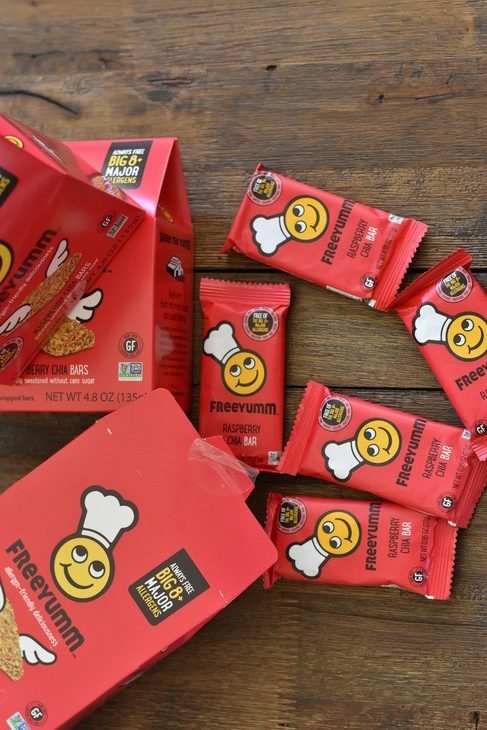 Free Yumm makes delicious kid friendly snacks (mom friendly too) that are cute, fun, and healthy! These lovely little bards are perfect for lunch boxes, or t keep on hand for hangry kids. 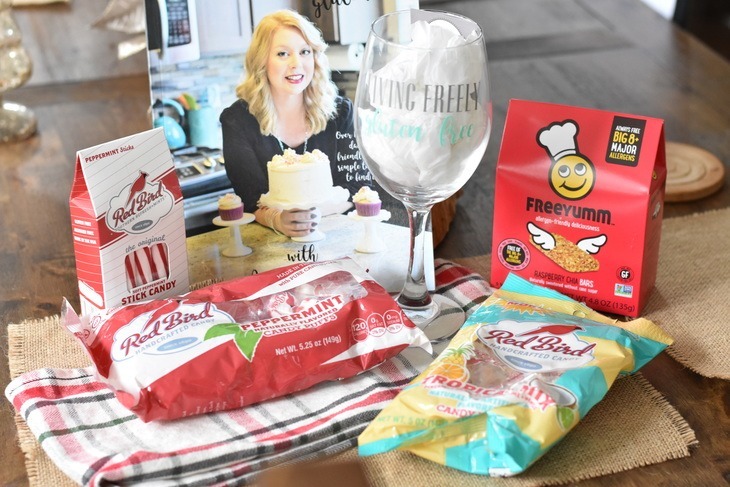 A cookbook, wine glass, Free Yumm, and Red Bird Candy. A little bit of everything to share with you! Flax 4 Life is a brand I have been eating since I went gluten free. 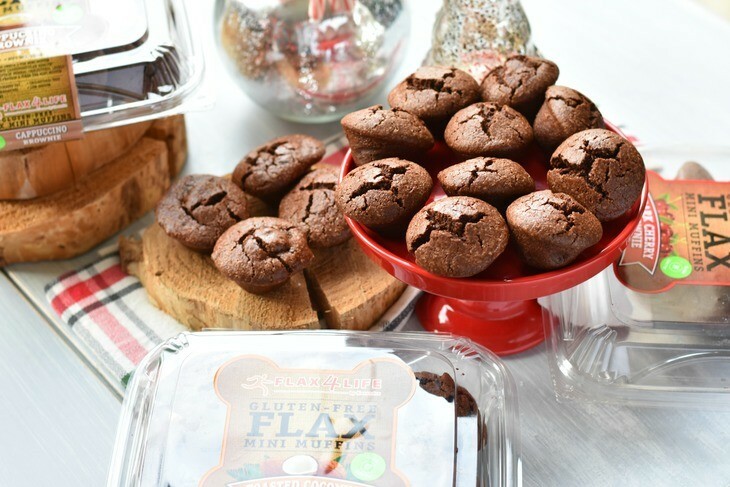 The muffins and brownies are amazing and the ingredients are awesome. Everything tastes like dessert, but I have no guilt allowing my family to nosh on all of their products. Head over to this Flax 4 Life Blog Post to enter to win this awesome prize pack. Bryan Anthony makes the cutest jewelry to share with your girlfriends. I feel that all of you are part of my gluten free tribe, so I wanted to giveaway a necklace that symbolized that. 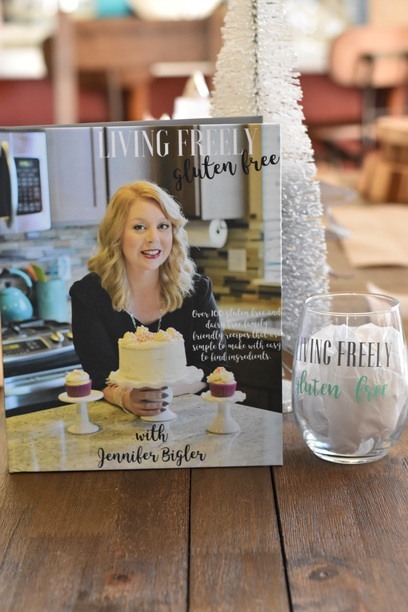 Of course a good book to go with it as well so you can really be part of the Living Freely Gluten Free Tribe. You will be ready to cook and have a cocktail while doing it with this fun prize pack. This is a Facebook giveaway. Head to FACEBOOK to enter to win. 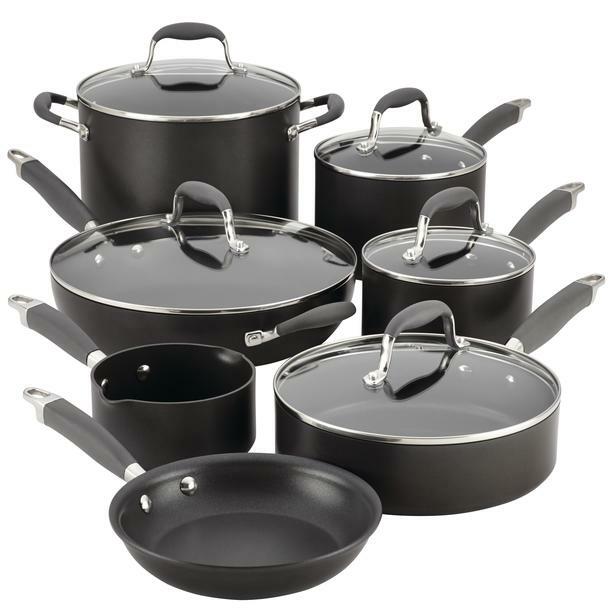 ***GRAND PRIZE***Day Ten 12/14/18- Anolon Cookware Set!!!! I am so excited that Anolon is participating in this giveaway and they are the GRAND PRIZE! This is the exact set that I use and I LOVE IT!! These are the best pans I have ever owned as an adult and they cook eggs and pancakes like a boss. Thank you Anolon! Head HERE to the Chocolate Chip Peppermint Skillet Cookie recipe to enter to win. Click HERE to enter to win on the Chocolate Chip Peppermint Skillet Cookie blog post. I love that too! I have been wanting to make vegan white chocolate but I am intimidated. Don’t be intimidated! Just try it! I make a chocolate and peanut butter candy that tastes just like a recese PB cup, but it’s dairy and gluten free. Yum!! I love Reese’s pb cups! Those are my husband’s favorite! I make them homemade for me and the kids so they can be dairy free. My wife makes large pretzel sticks dipped in chocolate with sprinkles on them that are one of my favorites. We primarily make cookies, so my exposure to candy is a little limited. I would share with my niece, Monica, and we would make our favorite holiday drinks with cranberry juice and vodka with a touch of club soda and lime. I’ve never had one. I need to try! My favorite christmas candy is the chocolate orange. I love chocolate orange too! Candy canes are my favorite. Have you had side effects with CBD oil? My favorite holiday candy is peanut brittle, but my daughter is a huge mint fan and would love the chocolate peppermint cookies. I have been wondering if there are any drug interactions to worry about with CBD oil. As in if you are already taking medications how it will react? I just wonder how safe it is to use, has it really been studied for long term effects? I am most concerned about failing a drug test because of what it is derived from, similar to the Seinfeld episode where they thought the character used opium because she ate a bagel with poppy seeds!! LOL!! I did read that because CBD is derived from hemp that it can show up in a drug test. 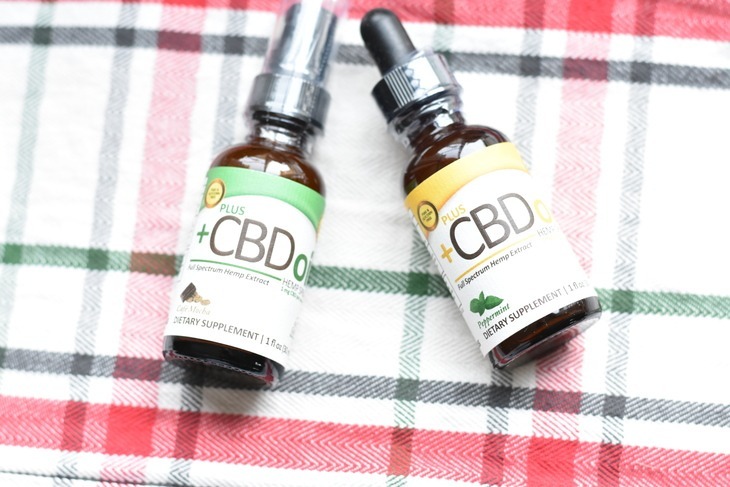 What does cbd oil help with being gluten and dairy free? I also have Crohn’s disease and have heard of the oil, but I don’t know much about it. I’m just curious if there’s any THC residue. It is THC free. Since it is derived from the hemp plant there is no THC. I don’t really eat candy, but I do love me some puff candy because it just melts in your mouth. I would love to try the cbd. I didn’t realize there were so many options. Yes, the options are amazing! Enjoy life. Pinned using the link. No picture though. 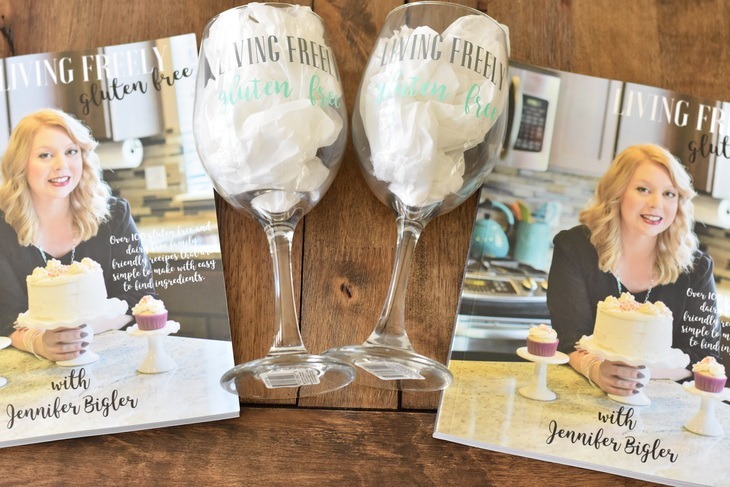 Cookbooks and wine glasses, who wouldn’t these. Thanks. The chocolate chips are my favorite Enjoy Life product. We love the Enjoy Life mini chocolate chips. My favorite Enjoy Life product is their chocolate chips-all of them! So nice to be able to make things that I can eat that need chocolate chips. Yes! They are awesome. The chocolate chunks are fun too. My favorite holiday candy is Reese’s Peanut Butter trees. My favorite Christmas candy is my moms homemade candy! I can not get enough of Enjoy Life’s Plentil chips! Those are my weakness too! My favorite is See’s Cashew Brittle. What time of the day do you take your CBD oil? I have used the little breath strips and take them at night and they really help with my anxiety. I usually take mine with lunch because early afternoon is when I start to get cray. Sometimes I forget though and take after dinner. I love the Enjoy Life mini morsels they are so good sometimes I just snack on them alone. Yes! My kids love snacking on them as a treat. My favorite are their double chocolate chip crunchy cookies. I just began using a CBD oil. I was wondering about the gummies. How are these used & do they work like the oils? I have not tried the gummies, but they are made with the oil and are just like taking the oil but in gummy form instead. Ok, thanks. I may give them a try. It’s really great that you’re doing these give aways! Thanks!! 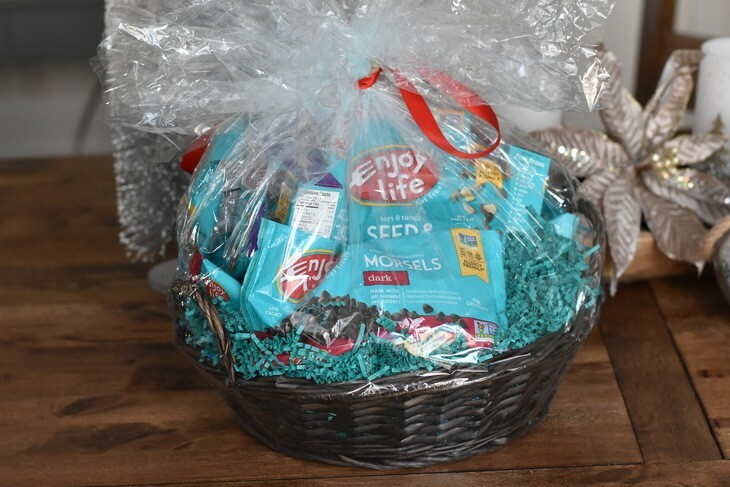 The Enjoy Life Soft Snickerdoodle Cookies are amazing–I’ve bought those quite a few times and love them! After opening the bottle of CBD oil, how long is it good for? I would go by the date on the bottle. I have had my current bottle opened for several months with no issue. I can ask Plus CBD and see what they recommend. I have a few questions about CBD oil but what I am most curious about would be dosing. 3 mg is the lowest dose, so the best way to figure it out is to experiment and find out what works best for you. I need about 15-20 mg each day. are there side effects of the cbd? No side effects that I am aware of. It’s not a medication, so its purely natural. What mg would be the best for hip pain? It depends on your weight. For me 15-25 mg works best.